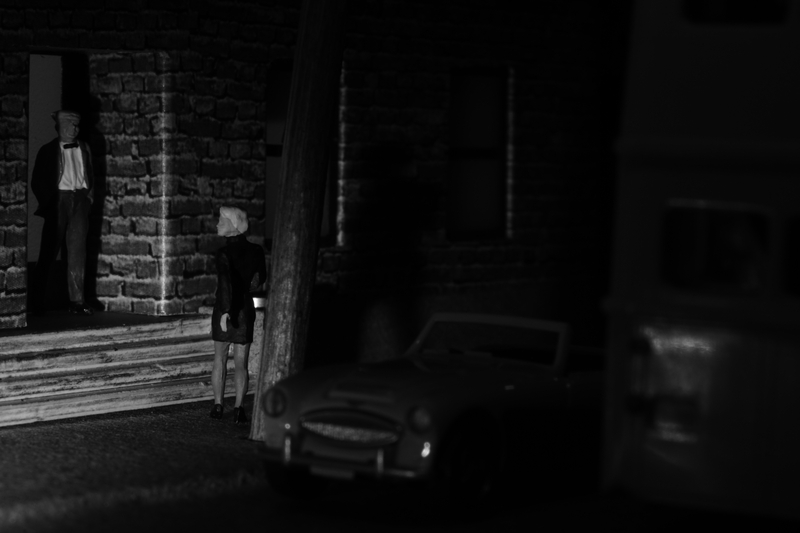 Although lighting is crucial in the Noir series, I never payed attention to how exactly I proceed. I do not know much about light. I only have a general idea of the look I want to achieve. And then I kind of play around, which at the end of the day leaves me with lots of pictures that are ‘same but different,’ as they say. 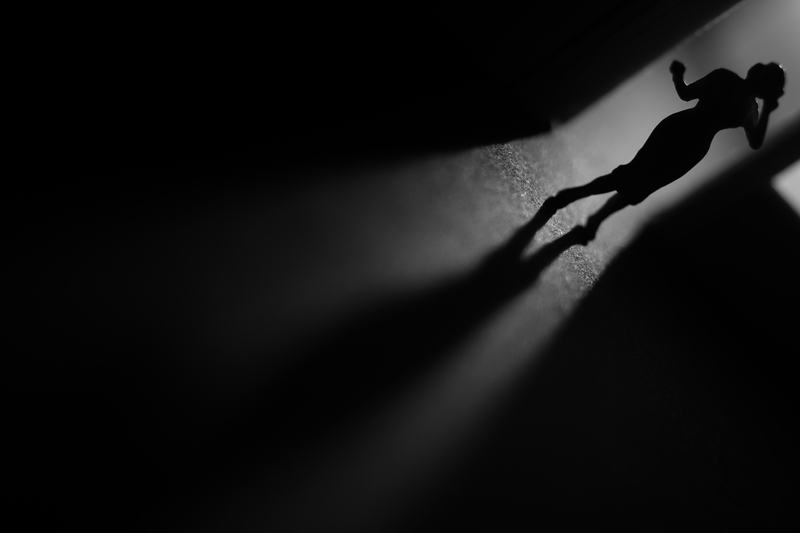 At one point for example, I wanted the central person to be illuminated by light falling out of a door or a window, casting a long shadow. That’s how Noir started, and you can tell from the first pictures of the series that in the beginning, there was the light, and then the story followed. First the light, then the couple. But they are cute, aren’t they? But in the run of the course came a shift of attention towards story telling. I still wanted certain pictures, but now I’d try to better integrate them into the narrative: For example, I wanted that car down the slope; so how could it be a more or less plausible part of the story? Shifting perspective like that, light at times became a different matter. I started thinking in ‘scenes’ (like “woman getting on the bus“). With that, I imagined light sources as they would be in reality: Light from the sky, street lamps, lights shining out of buildings, car lights. And I decided for a basic, all-over source of light to set the mood: Is it a sunny day? A clear night with a full moon? Do we have street lamps on? Down those well lit streets: I later found out that using these lamps rarely makes sense – unless you want them to be part of the picture. 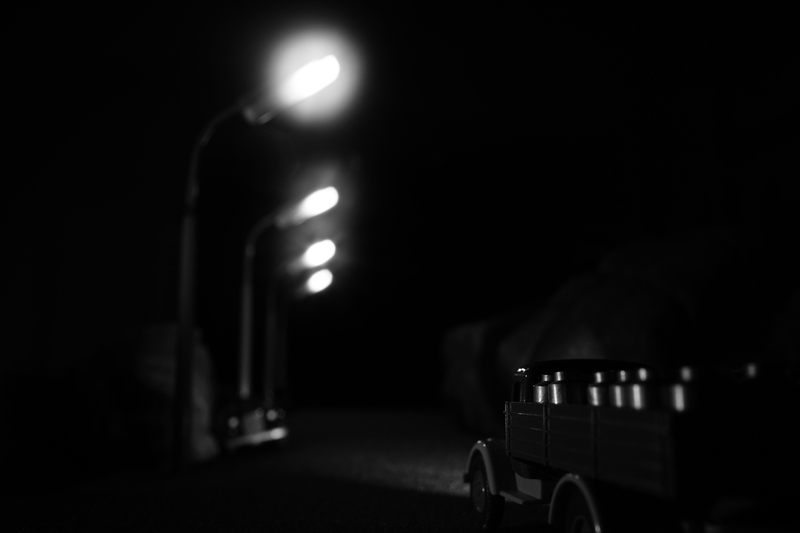 Then I tried to ‘translate’ the real world light sources into the minuscule H0 scale. I set those ‘naturalistic’ lights to see how they work: Do they make the important parts of the picture visible? – A question like that means that I work my way from darkness toward light, rather than lighting everything and then trying to arrange the shadows. Once I have the important parts of the picture in broad light, there is something else to consider: Does the light evoke a sense of drama? Is the atmosphere anything I would expect? When I arrive at this stage, switching off lights can be as important as switching them on. 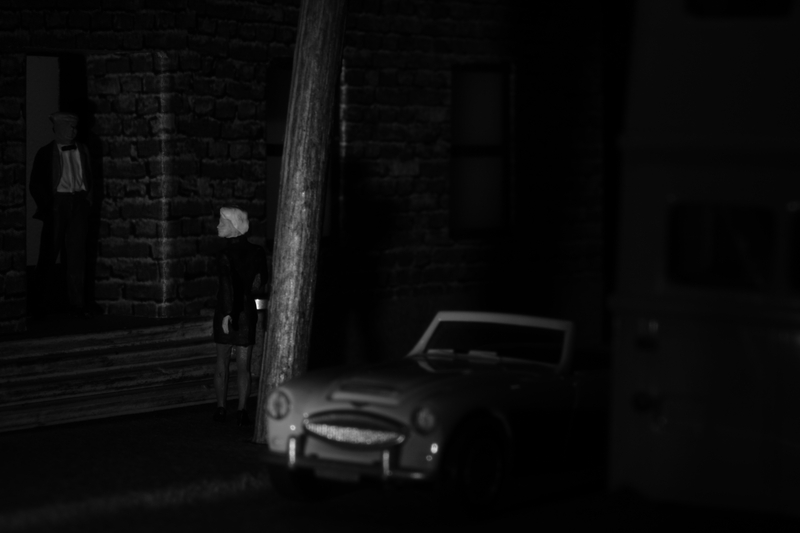 Some of the later pictures in the series were supposed to be lit by the miniature street lamps. But once I had lit the scene, I just switched them off to see if they made any difference. They didn’t. So I put them away altogether, giving me more maneuvering room for the camera. Not quite what I had planned: I went for a ‘plain’ daylight scene, but it lacked drama. So here’s what looks like a quite sunny late afternoon to me. Proceeding like this, I might end up with something very different from what I started with. Sunny might turn into extremely shadowy and vice versa, just for the sake of composition, visibility, and drama. Same but different… I used the same light source in all these pictures and only changed the light by moving the lamp around. I considered adding a list of light sources I use but then decided against it. Because it is too much fun to grab any source of light you can get hold of and play around with it. I would not want to spoil that for you! Did you ever play with light? Did you ever try out different sources of light? Do you have a favourite? I love the way you control light, and with the scenery and the cinematic style works so well. I’m totally hanged up with light but I don’t see myself doing anything like this. I love the dramatic light, and how well it corresponds with the idea! So amazing! 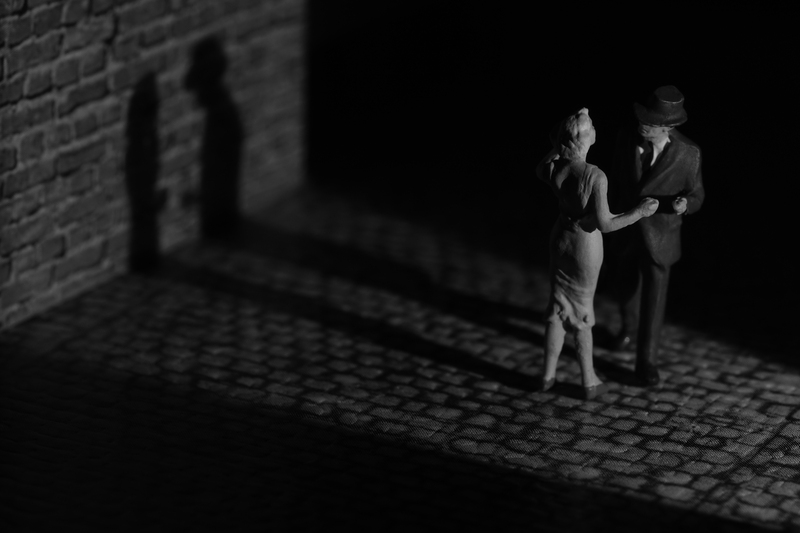 I love the process of scaling down light and using mini lights only to light a scene. You e described this process wonderfully and use it so beautifully in your work. 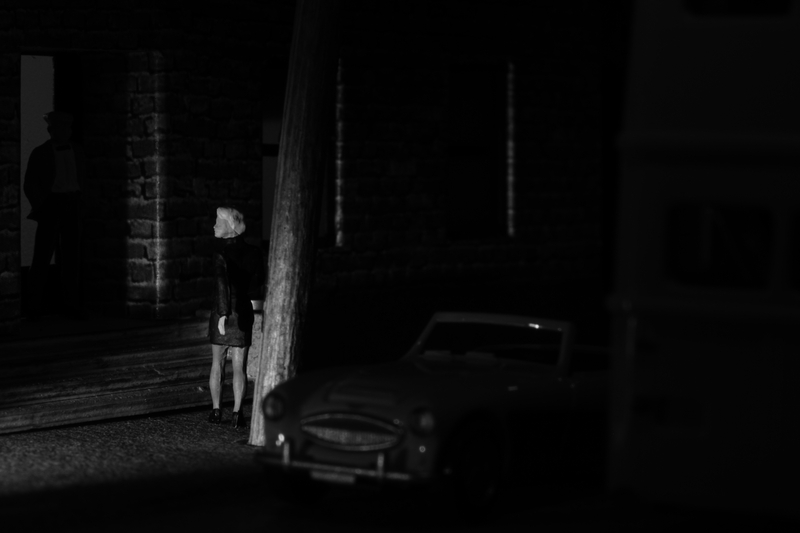 I’m always stunned by the images in your Noir series. I have noticed that when portrait photgraphers (Joel Grimes, Scott Kelby), product photographers (Tim Wallace), or life photographers (Joe McNally) attempt to light a scene, they always start with a blank canvas light-wise, then add in lights one at a time until the scene is lit the way they envision it to be. Getting realistic light can make or break a photo, especially a model (and doubly especially a composite). Getting it right can take a photo to new and awesome heights.